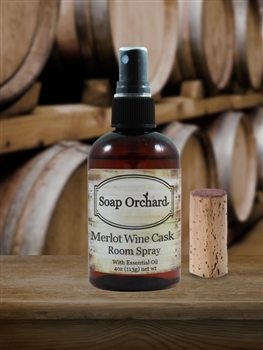 The Merlot collection has a subtle scent of its fruity wine name and a sweet orange and cherry finish. We have added a unique scent surprise of uplifting tobacco leaf. A mix that appeals to both men and women. It was born of our wonderful memories at a wine tasting we had, in the barrel room, in the Napa Valley. 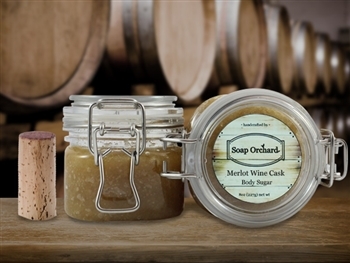 The unique perfume of sweet wine and wood mixed. Glorious! 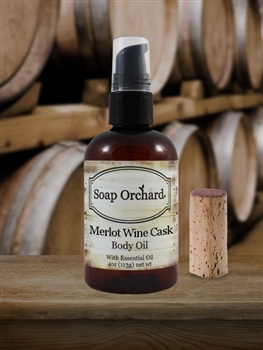 Grapeseed Oil, extracted from the seeds of the grapes used to make wine. It is has a high absorption rate and doesn’t leave skin oily - wonderful for sensitive skin. Orange is loaded with Vitamin C and antioxidants to fight free radicals.